FA: Pete Soby, Charles Schobinger, 1958 (from Gillett)? 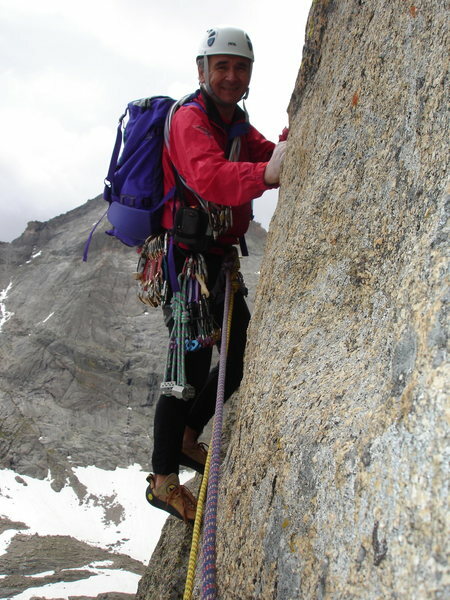 The North Ridge is a good beginner alpine route. The first half is forgettable, but the last two pitches are perfect for their grade. Stay to the left of the ridge to find the last two pitches. Expect 6-8 pitches depending on your rope, your belay spots. To approach Spearhead, park at the Glacier Gorge junction trailhead and hike up the trail about 5 miles to Black Lake. From there, head east up an unmarked trail to tree-line, then contour over to the base of Spearheads NE face. The North Ridge route begins at the NW corner of the mountain. Be careful to chose the correct line at the start; parties have gotten off-route here onto much more difficult terrain. Look for a pronounced groove above a slab near the highest point of ground. Climb up poorly protected slab to the base of the slot, then pull huge jugs up the left side of the slot with good pro. Continue up easier grooves and slabs for several hundred feet, angling to the left. At that point you should reach the very crest of the ridge, and the prominent flake/pillar of the Barb should be visible down and to your left. These initial pitches are often simul-climbed, but most parties rope up here. Climb a shallow corner on beautiful rock right of the crest, traverse somewhat right and head up more cracks and corners to a belay (5.6). The final pitch head for an awkward, acute dihedral, also 5.6. 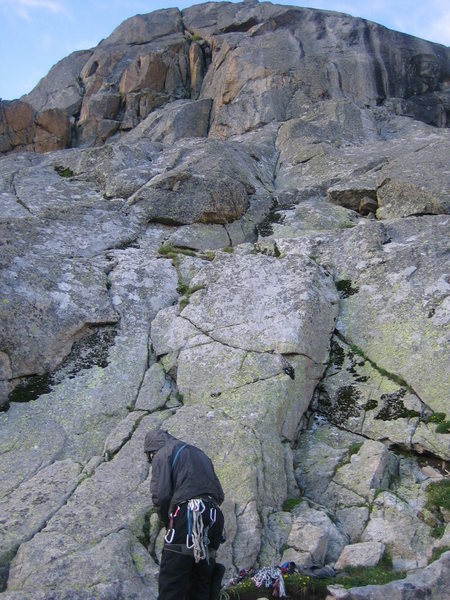 The route-finding can be confusing on the upper ridge, although many lines are climbable. Mountaineering judgment is essential. The summit, a short scramble up to your left, is absolutely spectacular and totally worth a visit if the weather is good. Descend significantly to the southwest, to avoid getting cliffed, down slabs and scree until you can contour around to the base of the climb. Easy slab moves in the middle of the North Ridge. Nice bivy at base of Spearhead North Ridge route. Final pitch up the North Ridge. Looking toward Long's and Pagoda (left to right). Dave sitting on top of the Barb Flake. Jon on face below crux pitch. Charles Goldman leading up the 3rd pitch. 'E' on the cool, airy summit. J. Stiles on 1st pitch. Jon at bivy - start of route in background. 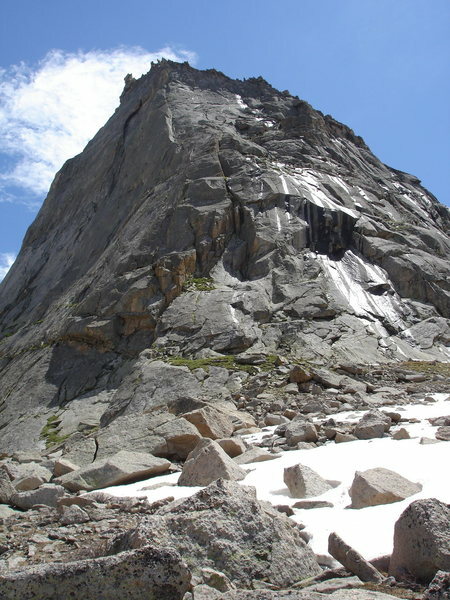 Profile of the North Ridge with Charles Goldman. Leaving the Barb flake belay, 2nd to last pitch. No hands on the slab just before the Barb Flake. Tippy top of zee ridge. Glacier Gorge from the North Ridge. I'd have to recommend staying out of the Barb flake/gully. The slabs to the right are bullet granite, 5.2-5-4, with enough pro. You'd need a chisel to find a loose rock there. Have to reiterate what others have said about the spectacular summit--I've scrambled up the descent route several times just for a day hike! Went up to do Syke's, but there was a very slow party on the route so decided to see if we could make the North Ridge interesting. The route we did follows an obvious weakness and broken crack system from the bottom to the top (see picture below). It is a good option if Sykes' isn't available and you are not feeling 5.11 or 5.6. We did the climb in 5 long pitches (all 185-200 ft), but it is probably a good idea to break up P1 and P5 in to 2 pitches each due to rope drag. P1 was done as one due to poor belay protection at the bottom of the 5.8-5.9 section. P1: I believe this is what is described as the direct start. Begin up the dihedral about 100 ft right of the face. Angle left across an unprotected slab to a steep finger and hand crack. Work up the crack (9) to another slab, then move up and left across the slab to below at the base of some clean broken flakes (185 ft. 9). P2: Go straight up the flakes into a wide crack and stay in or near the crack for about 190 ft. (7). Climbed on 8/20/5. Dr Dan has a great photo below, but it's a bit misleading. His P1 starts as for the classic route, but takes a crack right of the slab. P2-P4 in his picture are the classic route (not harder than 5.5). Our "classic" route is based on Rossiter's guidebook. There seemed to be a lot of variations in the 5.6 range. I'd give it 3 stars for the setting, length, and rock quality. The moves aren't as aesthetic as you can find 40' off the ground in Eldo, but this route gives you 100's of feet of quality climbing/scrambling on the way to the best summit around (I haven't been on the Petit yet). Our semi-athletic team made it car-to-car in about 10 hours, with about 2.5 hours for the approach. It was nice not carrying bivy gear. Try to get done early, because it doesn't look easy to retreat from. Tim, reflecting his true generous nature, only posts our find of the rope and gear, but neglects to mention the troubing loss of his convertible pant's left zip-off leg somewhere along the descent. Fellow readers, I implore you to return this lonely piece of nylon to him, should you chance upon it. The poor guy was inconsolable once he realized he lost it. Our semi-athletic team was slowed considerably by 3 factors. 1) Tim's athletic and I'm not. 2) On the hike out, Tim threatened to set fire to the new hiking mascot I had strapped to the outside of my pack. This forced me to stop and hide the mascot in the depths of my pack. We lost at least 30 seconds due to this. His aggression was most likely due to the loss of his pant leg (inconsolable...).3) Also on the hike out, we paused to answer questions from day-trippers like "How will we know we're at Black Lake if there's no sign for it?" We promised to bring this obvious oversight to the attention of the Park Service. Another loss of a minute or two. On 7/30/06 our apparently very unatheletic team did it in about 15 hours car-to-car but included at least an hour of dorking around on the summit. We also missed the correct descent and floundered down the most miserable talus slope I've ever encountered. We were able to follow Roach's description to the letter (though we combined is first three pitches into two and divided his last pitch into two). Did this route today, and I believe we were the only party on all of Spearhead. I guess going up during the week can have its benefits. We did what sounds pretty close to the Dr. Dan variation, and this added some very enjoyable and challenging climbing to the North Ridge and makes for a far more direct line. I give this climb 4 stars for its superb location, the quality of climbing, and the overall alpine experience. Yes, it's a hump, but that's part of the experience! Don't let the rating dissuade you, there is no 5.7 (or 5.9) on the standard route. The 5.7 rating derives from one fellow who took a different route. I climbed this when I was still scared of 5.6 leads and felt it was easy. There are a couple (and one hugely exposed) moves of 5.6 though followed by a whole lot of easy and well protected climbing. With S. Costello and Karsten Schnatwinkel 9/16/07. This is a good alpine climb in a great setting. We did (I think) the 5.8 start which felt easier than the grade. Simulclimbed the slabby stuff on the next several pitches. Rossiter describes the second-to-last pitch as "a great pitch" and indeed it is...not difficult but the abrupt arrival at the edge of the ridge and the awkward moves above it are not to be missed. This pitch alone is worth the considerable effort involved in doing the route. Numerous variations on the described route are possible. Be creative. Climbed last weekend, route was dry and in great conditions (I was somewhat concerned about the snowstorm a couple of weeks ago). Bill Wright and I did this on 7/25. We then continued up and onto the North Ridge of Chiefshead. This is a very obvious link-up; we were shocked there is no mention of it anywhere. Spearhead is essentially a protuberance of the Chiefshead North Ridge, so once you get all the way up there, you might as well keep going. "Spearchief". Chiefshead N Ridge is broken up by talus slopes, but the headwalls turn out to have excellent climbing. 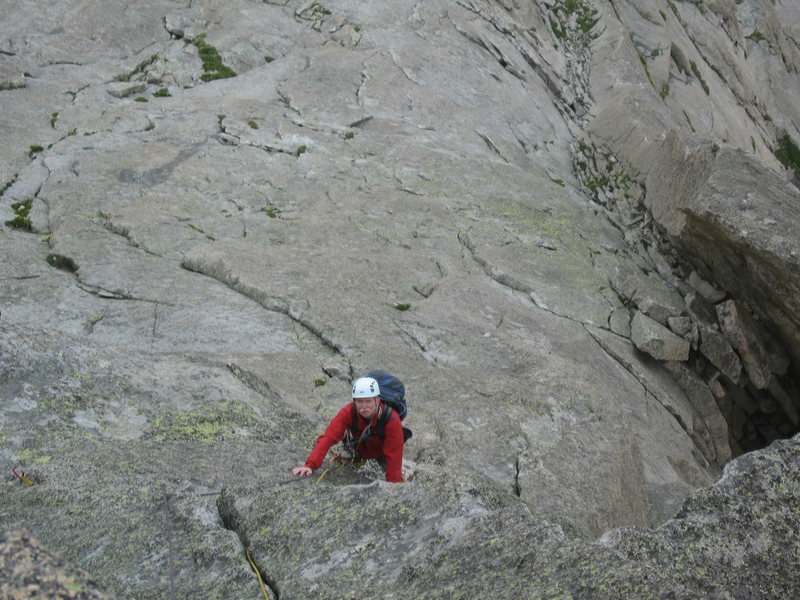 The lack of continuous 5th class rock may bother some, but hey, this is what alpine routes are usually like. The climbing is steeper and stiffer than Spearhead but more discontinuous. The position is always terrific, and it all works better if you know how to simul-climb. Getting off Chiefshead takes effort, which IMO, adds to the overall experience. We climbed it on 7th Sep, 2010. Windy day! Car-to-car 12 hours. The route finding is a little complicated. The crux pitch is brilliant and exposed. See video about almost every pitch. We climbed the route on July 12th setting out from the Glacier Gorge trailhead at 2.15am. There was a lot of packed snow above 10,000' which made the going slow and trail finding tricky in places, but we arrived at the base of the climb just after dawn. The start is obvious because of the worn rock and bare patches in the grass - get this bit wrong and you probably shouldn't even be up here. Looking up at the tightening chimney above you probably hope the route doesn't go there...but it does and the pitch through the chimney is excellent and well protected. That's more than can be said for the slab leading up to it. We encountered running water across wide sections of this first pitch, but this really wasn't a big problem because the rock is so rough and friction is great...even when wet. Top 3 pitches were outstanding. I think we were a little right of the correct line leading up to the final pitch, but this didn't really matter. The top pitch looks a little improbable from below but is really very straightforward. The crux crack/groove seemed to pass very quickly and had great protection. The descent certainly requires care. Stood at the top of the climb looking down the west face you will see a large, flat block/boulder with a steep track leading down. Drop down this track and then traverse horizontally left (looking out) over the boulder for about 200yds and connect with a definite trail that heads down to an easy downclimb. There is a lot of loose rock on the descent, so be very careful if parties are above or below. We were done by 12.30pm, stopped for lunch, took lots of photos and were back at the car by 6pm. Great weather. A great climb. By the way, we are just a couple of old farts having fun, I'm sure these young rock jocks could do it in half the time. Looking up the route from our descent. Straight up the chimney and obvious crack above. About to begin the difficulties on the final pitch. A bit of context here: I wrote this route description when this site was just being conceived, long before any of us knew what the site was our would become to be. The only existing routes on this site were buildering routes on the engineering building at CU. There were 6 registered users, and we probably received 10 visits a week or something. The main climbing site on the internet was rec.climbing. I submitted some brief descriptions of routes to Myke on a floppy disk as a sort of quick, general overview of classic routes in the Front Range, hence the one line description. My brother came and added more info later as the site was beginning to grow. His description lacks some of the detail of modern day Mountainproject (thumb catch on the left hand pinch 16 feet up pitch 7), but it is not inaccurate and coupled with the prerequisite mountaineering judgment needed to play in the mountains is more than enough. Beautiful, 6 mile approach. Solid 5.6 climbing, could be a tad harder if you go left on the East face above the Barb flake. Great exposure there with plenty of gear. Hardest moves seemed to be the slot on the last pitch, polished there but has good gear placements. Walk-off is no give-away program. Climbed this route on June 14th, 2015. Didn't see any comments about June ascents, so I wanted to provide some conditions beta. The route is certainly accessible in June, but bring snowshoes to access the base and mountaineering boots to kick steps down the descent gullies. You'll encounter some snow in the chimneys on the first two pitches, which will make things interesting but nothing you can't traverse around. A lot of the bivy caves will still be snowed in by June. It starts off easy and gets more interesting for the top half. First half is between 5.0 and 5.4/5.5. Then after 4th class section, it gets harder. 5.6 section leftmost section above Barb's flake with left-facing dihedral feels more like 5.7 at points. 5.6 to 5.5 and then the section before the final belay station on the left leaning ramp feels like 5.7.